Captain Will Huffine was born and raised in southeastern North Carolina. Coming from a family of avid outdoorsmen, Will spent much of his youth fishing, hunting, and surfing the coastal waters around Wrightsville Beach. His father introduced him to his first fly rod at the age of 8, and new passion was born. Will’s introduction to fly fishing began on weekend trips to the North Carolina Mountains to target trout in the state’s numerous small streams. 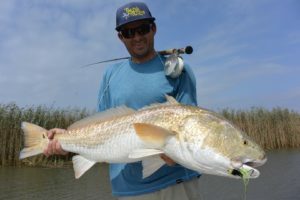 As he grew older and more competent with a fly rod, he began to use it to pursue some of his favorite coastal fish species including redfish, speckled trout, and false albacore. After graduating high school, Will headed to the University to North Carolina in 2004 to pursue his undergraduate degree. After his freshman and sophomore year however, his passion for the coast brought him back to Wilmington to eventually complete his studies at the University of North Carolina Wilmington. Will’s career in Wilmington began in the outdoor retail industry with a local retailer that specialized fly fishing, camping, and kayaking equipment. While working for the retailer, he continued to spend as much of his free time as possible pursuing his love of the outdoors. During these years Will expanded the scope of his fishing beyond the Carolinas, and was fortunate enough to follow his interests to destinations such as Belize, the Bahamas, the Florida Keys, Montana, Oregon, and Alaska. After several years of working solely in retail, Will began guiding inshore fishing charters part-time in his home waters around Wrightsville Beach in 2012. During the slower fishing months he also began to guide upland hunts in central North Carolina. After two years of guiding part-time and working retail he decided it was time to follow his passion for guiding full-time. In the summer of 2014 Will headed to Alaska to guide for Tikchik Narrows Lodge. Tikchik is a premier all fly out lodge located in the Bristol Bay region of Alaska. It served as Will’s summer home for 5 years as he guided clients for trout and salmon in some of Alaska’s more remote fisheries. During Alaska’s off season, Will continued to guide upland hunts in the fall. His hunting season would start guiding pheasant hunts in South Dakota and then transition to quail hunts in Georgia. After quail season wrapped up you would most likely find Will in the Florida Keys during April and May before heading back to Alaska. Over the course of his travels Will stumbled upon the waters of the Southeast Georgia Coast and knew he had found a hidden gem. After stopping through to fish the area between seasonal guide jobs for several years, he decided to leave Alaska and upland hunting to guide in Coastal Georgia full-time in the fall of 2018. Will strives to create a spectacular customer experience, and his courteous and professional approach is a welcome addition to the Southeastern Angling Team.